A brilliant concept, well executed. This is the second EP in the Tokyo trilogy by electronic artist Smu released on the German TUMA cassette label on August 1st, 2016. The description on Bandcamp reads as ‘Soundtrack for Roaming through the City of Neon Lights’. And how apt is this description! Each track is an ode to a suburb of Tokyo city and tries to capture the essence of that neighborhood through field recordings of urban nightlife which forms the base to the various electronic sounds layered on top of each other to create a sort of identity for that particular region. Japan is seen as a sort of neon soaked futuristic city and has inspired many great synth driven scores for sci-fi and cyberpunk projects. The first track ‘Akihabara’ which refers to the tech and gaming capital of Tokyo conveys the energy and rush of activity associated with the area through pacy drums ‘n’ bass over some pretty tense background notes. It has a retro game music feel and having been to Japan, I can’t stop reminiscing walking through the crowded streets of Akihabara with skyscrapers on both sides full of huge digital billboards and gaming related cafes. Meanwhile, the track ‘Asakusa’ has a blend of traditional Japanese wind instruments interspersed with pulsing drum machines – a fusion of old and new cultures – just like Asakusa’s ancient temple, the Senso-ji shrine which is a place of serenity amidst the surrounding frenetic activity and a reminder of Japan’s rich heritage. Similarly, the next track ‘Roppongi’ is very racy and evokes a club-esque atmosphere with it’s hip-hoppy beats and vocal overdubs signifying the lively entertainment district of Roppongi Hills with its numerous cozy bars and nightclubs. The album is comprised of six tracks of roughly four minutes each. 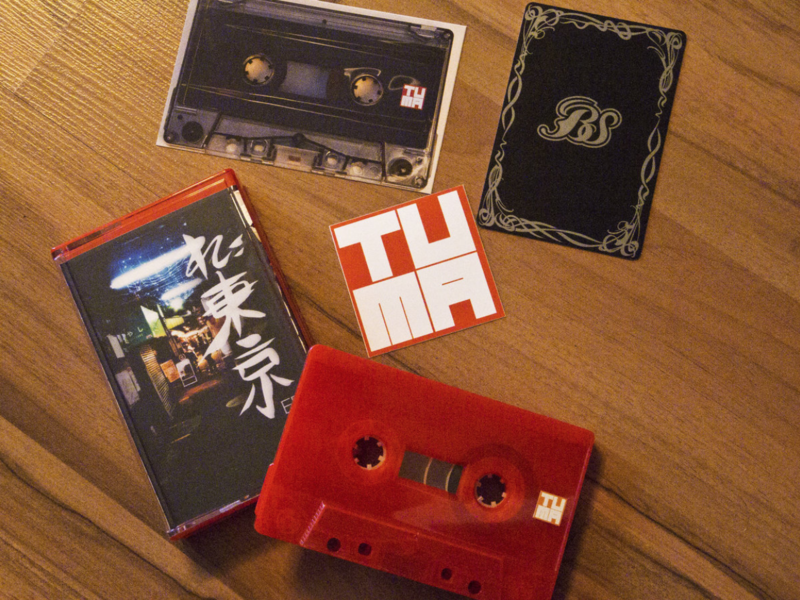 The tape sounds very nice and is housed in an almost blank red shell with a small TUMA logo on each side. The cover art portrays one of the Tokyo bylanes at night with the album name in big Kanji lettering. My tape came with a hand-written thank you note from the label saying that they never imagined sending the tape to someone in the Middle East! It is gestures such as this which one cannot get by buying music in other formats and restores one’s faith in the revival of tapes. This is a well executed concept album and if you enjoy this, I recommend you to explore the other two albums in the Tokyo EP series.